Geophysics can play an important role in helping solve resource exploration, environmental, or geotechnical problems. The application of geophysics is most effectively carried out by following a seven-step framework. Careful thought and due dilligence at each step is important to achieve a final outcome. Setup: What is the Problem? Assemble prior information that might be relevant. Details for using the seven-step procedure will depend upon what information is being sought and what is available. Surveys: Select a geophysical survey that is sensitive to the physical property of relevance to the problem. Design an effective and efficient methodolgy for collecting the field data. This will involve forward modelling and processing of the simulated data as well as addressing issues of noise and data quality. This builds realistic expectations for what information can be expected from analysis of the geophysical data and the overall suitability of the chosen survey. Data: Carry out the field survey taking all necessary actions to ensure complete, high quality, and cost effective data sets. Geophysical data can be acquired in boreholes, on the surface, or in the air using aircraft. Field procedures must permit acquisition of high quality data, yet they must be economical, and safe to obtain. Processing: Interpretations from the data require that the data be processed. This can range from simply making maps of the data to inverting data to obtain 3D images of the subsurface. Interpretation: Interpret results in terms of geological or geotechnical objectives.The goal is to draw conclusions or make decisions based upon the geophysical data. There are two distinct components to interpretation. The first involves estimating how physical properties are distributed. The second involves gaining some geological understanding based upon those physical property distributions. Just like much of the geosciences, non-uniqueness is a ubiquitous and persistent characteristic of most geophysical interpretations. Synthesis: Correlate the interpretations with prior and alternative information, and decide if your results are adequate for the particular problem. Synthesis means making sure geophysical results agree with everything else that is known about the problem. Also a judgement must be made about the effectiveness and completeness of the geophysical results, and their impact upon the initial geological, engineering, or geophysical question. This sequence of images summarizes the framework visually. All tasks in the seven-step process are inter-related, so the distinction between the steps can become blurred. For example, the geoscience problem will determine an appropriate interpretation procedure, which in turn will place constraints upon the survey design and choice of processing steps. Also, data processing, interpretation and synthesis are often tightly related. 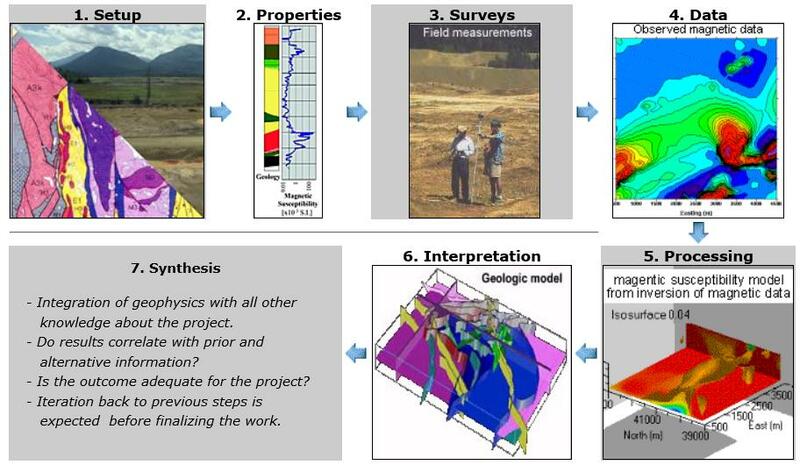 However, it is useful to think in terms of these seven steps because they form a framework, which can be employed for any application of geophysical work to applied geoscience problems. Setup: Establish the geoscience objectives, consider conventional practice, and identify how geophysics might contribute. Properties: Characterize materials that can be expected and establish the likely physical property contrasts. Surveys: Determine a suitable geophysical survey, and design an effective and efficient field survey. Identify possible sources of error, noise and mis- interpretation. Data: Carry out the field survey, taking all necessary actions to ensure complete, high quality, and cost effective data sets. Processing: Plot the data, and apply appropriate processing and analysis. Interpretation: Interpret results in terms of physical property distribution, and then in terms of the original geoscience objectives. Synthesis: Combine interpretations with prior knowledge about the problem, and with other relevant information. Decide if your results are adequate for the particular problem. Iteration is usually necessary.